Walking the Camino is a 45-piece painted travel diary by artist Barbara J. Sherman. In 2004, after having retired from a career in nursing, Sherman began planning a six week journey on the Camino de Santiago in Northern Spain. Two years later, in May of 2006, Barbara Sherman began her travels. It was shortly after beginning her journey that Sherman decided to paint a collection depicting her walk along the Camino. Each painting in Walking the Camino corresponds to one day of Barbara’s walk, and provides a visual chronology of her six-week journey. 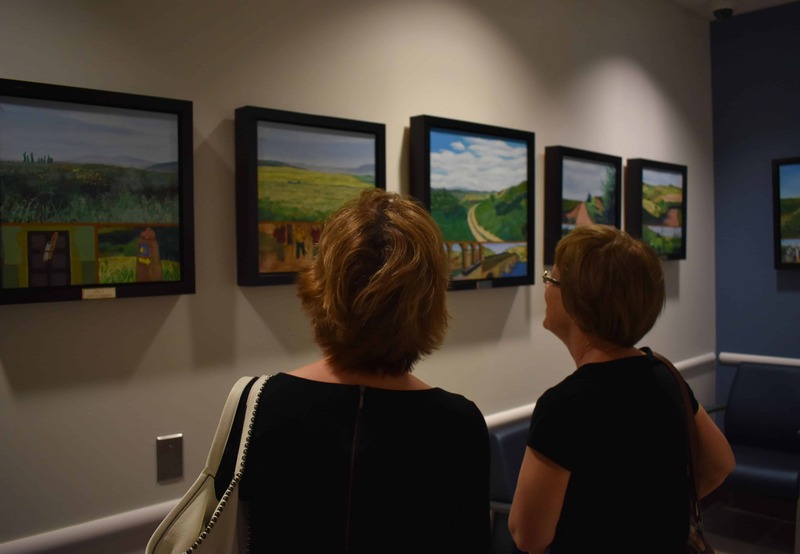 Thanks to Sherman, this collection can now call Providence Care Hospital its new home; the 45-piece collection will be permanently displayed in the Ontario Review Board Suite located on Level 0 of Providence Care Hospital. Thank you to everyone who attended the unveiling, and to Barbara Sherman; we look forward to enjoying these paintings for years to come. View an online catalogue of Barbara J. Sherman’s collection.